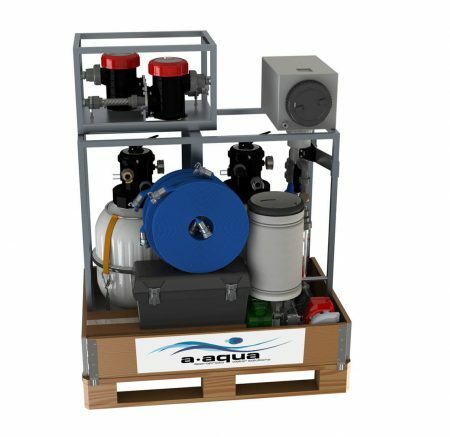 The EmWat 2000 produces safe drinking water from any fresh water source at a rate of 2,000 litres per hour. The unit is ideally suited for use in field hospitals, remote or temporary base camps or staff camps and in any situation where there is a need for a flexible, reliable system that is also able to deal with high levels of turbidity. It is quick and simple to install and extremely easy to operate. The basic unit can be upgraded to a Water Treatment and Distribution Kit suiting locations where there is no infrastructure for distributing the treated water. Upgrading to the kit option adds a further pallet to the consignment. Each component weighs less than 100kg so no lifting equipment is required at the delivery / installation point. The complete system can be set up without the need for mechanical assistance. The EmWat 2000 is compact and light weight and can be easily deployed via air freight to emergencies in any location. The unit is supplied with enough consumables for three months use (excluding pump fuel) and is packed for transport on a single standard pallet.